Update: Teddy Bear Convoy was one of our biggest yet! More than 145 trucks participated and $66,000 was raised for the Janeway! Thank you Just for Kids Transportation Group and all the participating truckers and families. 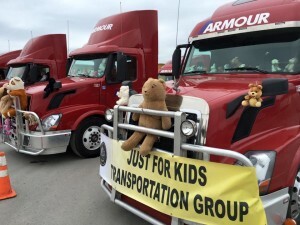 Teddy Bear Convoy 2018, a project of the Just For Kids Transportation Group, is gearing up once again in support of the Janeway! On Telethon weekend, June 2nd and 3rd, the WEST COAST convoy of trucks will drive around Corner Brook and the EAST COAST convoy of trucks is scheduled to drive around the Janeway Hospital. The convoy is one of the Janeway Foundation’s longest-running and most successful fundraisers and it continues to grow! We truly appreciate the efforts of the organizers, truckers and their families each year. CORNER BROOK Details: Trucks will gather at Watson Pond Ind Park on SATURDAY, JUNE 2nd starting at 10:00 a.m. Convoy departs 12:00 p.m. SHARP. Exit park, turn left and circle outer ring road joining TCH West at Murphy Square, West on TCH, back to Watson Pond Park. 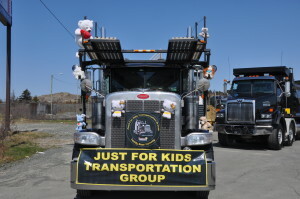 EAST COAST trucker friends and families: On SUNDAY, June 3rd the Annual Just For Kids Transportation Group TEDDY BEAR CONVOY will depart the City Tire Retread Plant, TCH and drive around the Janeway at 12:00 p.m. approximately. Last year was our biggest convoy where more than 100 trucks participated! ST. JOHN’S Details: From City Tire Retread Plant (TCH) to the Janeway on Sunday, June 3rd. Meet & Greet at 8:30 a.m. with a BBQ (sponsored by Marine Atlantic) to follow at City Tire Retread Plant (TCH) .